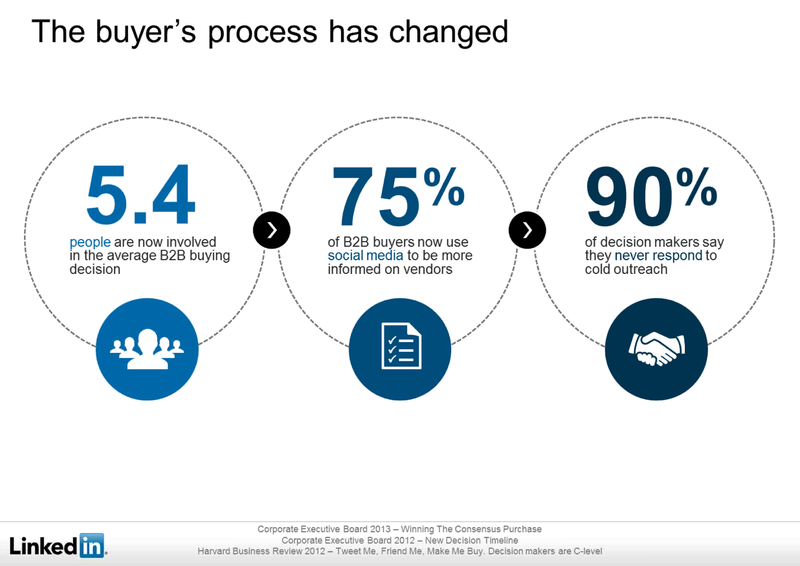 We often talk of Social Selling as being a culture change: a wholesale move to a new marketing model. 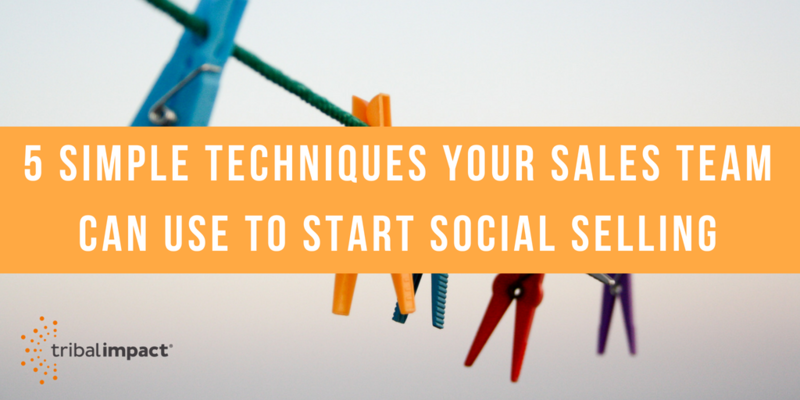 However, that doesn’t mean individuals can’t make great strides to start social selling. 1. Optimise your profile with keywords. Social media profiles are some of the top results on search engines so, like any other web content, they should be optimised. Taking LinkedIn as an example, you should be using keywords in your summary, work experience, skills and endorsements and title/current and previous experience sections of your profile. Action: Get your sales teams to update their LinkedIn headline and summary with a keyword optimised, customer-centric statements. 2. Start reading and sharing content. Immersing yourself in what your network is reading and discussing is essential to developing the right content plan for your audience. Becoming familiar with content, group discussions and the outputs of other thought leaders in your field will enable you to begin to understand the issues that matter and the potential pain-points that your prospective customers are experiencing. Sharing content should always be a value-added activity: try to comment or top-and-tail the original material to make it relevant to your business or your audience. Quality will always beat quantity, especially in our incredible noisy social media world. Action: Help your sales teams setup Flipboard or Google Alerts (if you don’t have an employee advocacy tool) using keyword phrases. Help them find industry related content that will add value to their buyer profiles and then how to share it on LinkedIn to generate good engagement. Use social media to build a profile of your prospect - discover what type of buyer they are, and what they are interested in. There are tools such as Crystal or LinkedIn Sales Navigator, which make this task easier. This step is critical to ensuring you are able to start sharing and personalising content, which will set you apart from your competition. It will lead to you being able to cultivate long-term relationships, crucial for influencing the buyer journey, across your platforms. Action: Lead your sales team through an example profiling technique. Find a best in class profile and walk them through how you use “Social Selling Goggles” to learn about the prospect both on LinkedIn and off. 4. Look Out For Engagement Triggers. When you see common content themes, people changing jobs or updating their profiles or – most importantly – engaging with your posts, make sure you react to these. They represent the perfect opportunity to show interest in potential customers and to deepen the relationships you are building. Engaging means liking, commenting and even resharing content relevant to your audience. It’s an opportunity to reach out and get on your prospects radar without being intrusive. Action: Walk your sales team through an engagement nurturing process e.g. like and retweet, then like on LinkedIn, then comment on LinkedIn, then reach out via referral. Help them understand how to create best-in-class referral emails to their network. Don’t forget this is an inbound driven model – not outbound. Your objective isn’t to close the deal. It’s to make a connection, build a relationship and possibly secure a meeting. Make sure you take the time to engage with others as well as curating your own content. Show you’re listening. It’s likely that you can also feed the intelligence you gain into your content plan to stay current and relevant to your audience. Action: Show your sales team how to search and engage with other people’s content. Give them guidance on when and how to comment on content – the main objective here is not to sell but to add value to the conversation. Buyers are turning blind to traditional advertising and sales methods for a reason. They want humanity and added value. They want to be understood – not sold to. By carefully nurturing your feeds – and, in turn, your audience – you’ll achieve the right balance to be seen as an expert and great person to do business with.